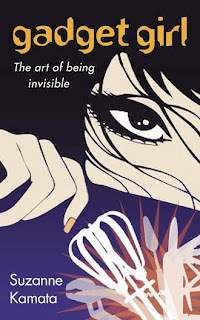 My latest book review is for Gadget Girl: The Art of Being Invisible by Suzanne Kamata, a Young Adult Fiction book set partly in Paris. Fifteen-year-old Aiko lives with her Mum, a sculptor, in the Midwest USA. Aiko is different from the other kids at school; she has never met her Japanese Dad, she suffers from cerebral palsy and her limp has led to harassment by some of her peers. Aiko just wants to be invisible. Her arty Mum is also a bit different, and although she wants the best for Aiko she is rather absorbed in her work and doesn’t really cook like other Mums. As well as normal teen issues, like boys and friends, Aiko also has to deal with her Mum’s relationships and the possible changes these may lead to in her life. But she has dreams, she would love to visit Japan and meet her father, so she is learning Japanese, and her passion is to be a Manga (Japanese style cartoon) artist. She has secretly produced her own Manga series about a super hero called Gadget Girl that is proving very popular, but no one suspects she is behind it. Thinking they are off to Japan for her Mum’s work, Aiko is a little disappointed when the trip turns out to be Paris and as she is her Mum’s model the spotlight is on her more than she would like. But will Paris and a rather attentive café waiter win her over? I may not be a teen any more, but I can recall some of what went on in my puberty addled brain and as this book deals with issues I can remember from those years it transported me back to my youth. I found the storyline to be engaging and the book moved at a perfect pace. It was a delight to read, it kept me wanting more and I’m sure it will appeal to young adult readers, especially art loving ones. Thanks to Suzanne for sending me a copy (all the way from Japan). Gadget Girl: The Art of Being Invisible is available in paperback and ebook format, links to Amazon.co.uk below.